Tisa called me first thing this morning to let me know that although there won’t be enough people for dinner to do the Samoan umu meal, she can still fix a nice Samoan dinner from all natural, local food that’s in season – sounded good to me! 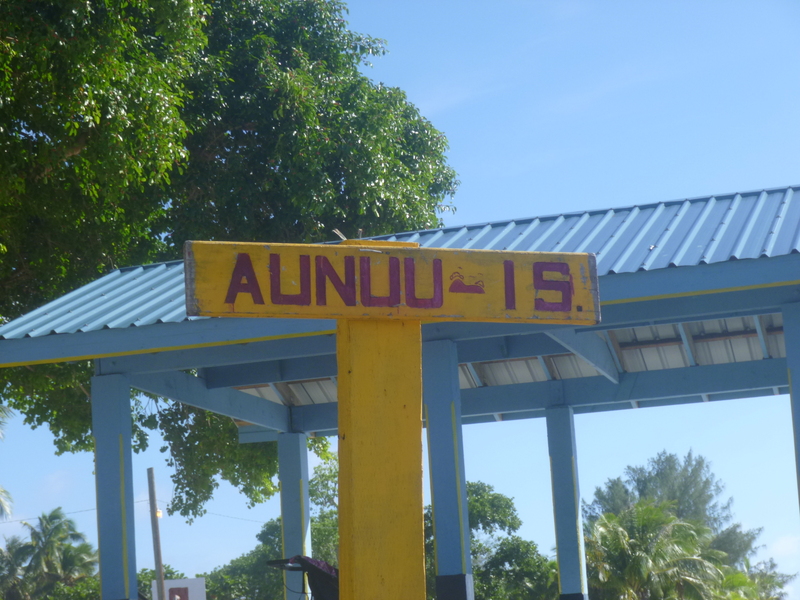 So I’ll be stopping by there on my way back from Aunu’u Island later. After doing some computer stuff in the motel office, I met up with Teri the news reporter for a late breakfast. She had a lot of questions, and managed to type on her laptop and eat breakfast more or less at the same time! 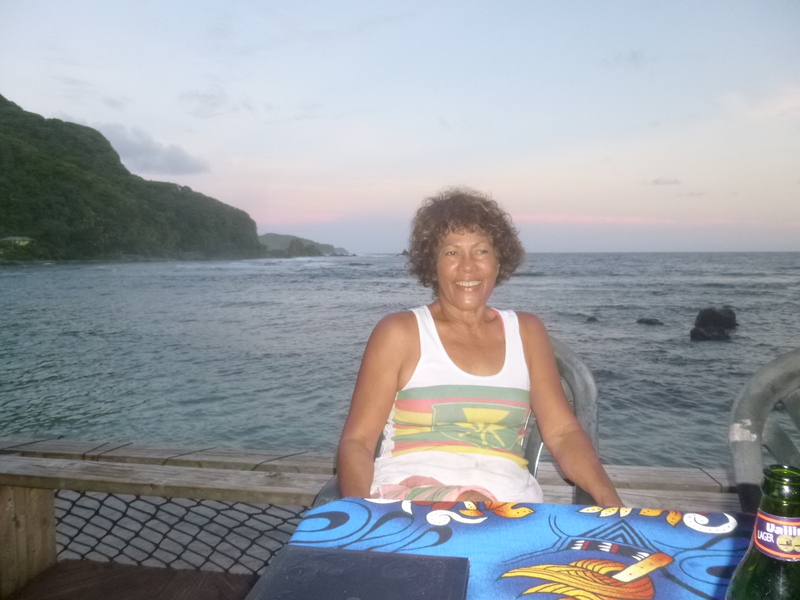 She was raised in California, and married a Samoan 30 some years ago, and has lived on the island for more than 25 years. 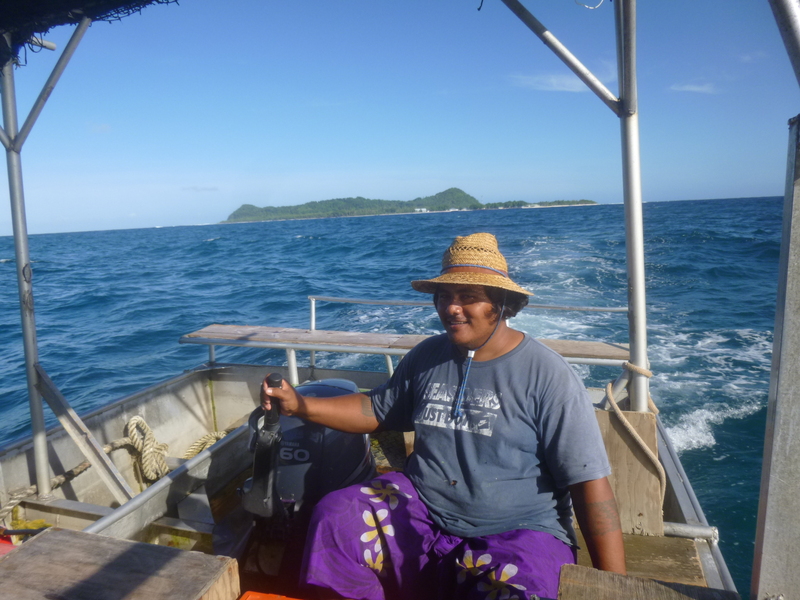 When her husband passed away, people thought she would return to the mainland, but the island is her home! It was fun to chat with her and she took lots of notes about my journey. And when we went to pay for our meal, we found out one of her longtime friends had already taken care of our bill! That was a pleasant surprise! I didn’t make a donation today since I made 3 yesterday. 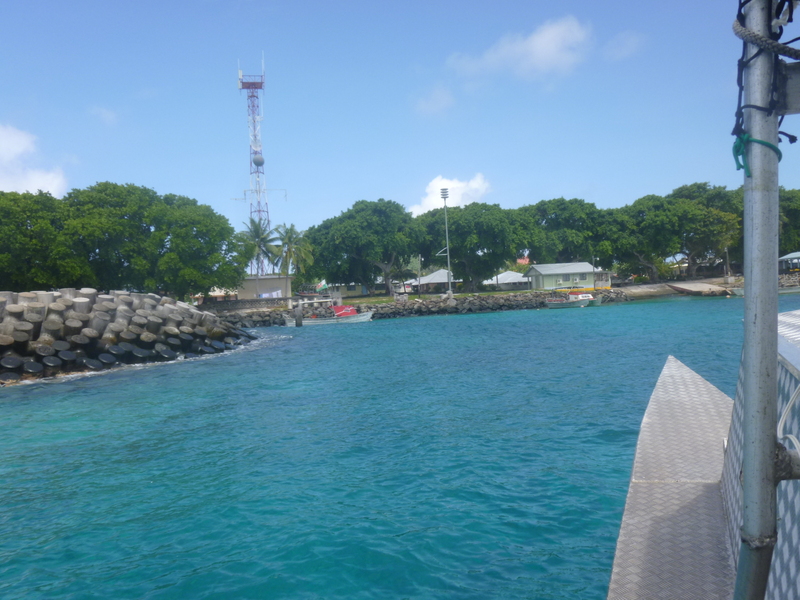 Then it was time to pack some stuff up to go catch a bus for the east side of the island where there’s apparently a small boat harbor with several boats that run back and forth between the “big island” (Tutuila) that most of us are on, and little Aunu’u Island. I walked down to the marketplace, and didn’t have to wait long for the Tula bus – the boat harbor is almost all the way back out to the east end. I mentioned to the bus driver that I’d like to get off at the boat harbor, but he forgot, and I totally missed it because the boats were out making their runs! They told me I could ride to the end of the route, and get off at the harbor on the way back into town, but I told them I didn’t mind a short walk, and got off at the next stop. It wasn’t far at all, and would have taken so much more time to just stay on the bus. Another family arrived to make the crossing – and there was a grandma and a young boy in the group. And that was kind if reassuring because when I saw the boat far off between the big ocean swells, it didn’t look like it was big enough to be out there! The boat sort of looked like a large wooden rowboat on top of catamaran hulls, with a tarp across the back half for some shade. There was a bench along the side, or people stand and hold on somewhere or sit under the tarp. 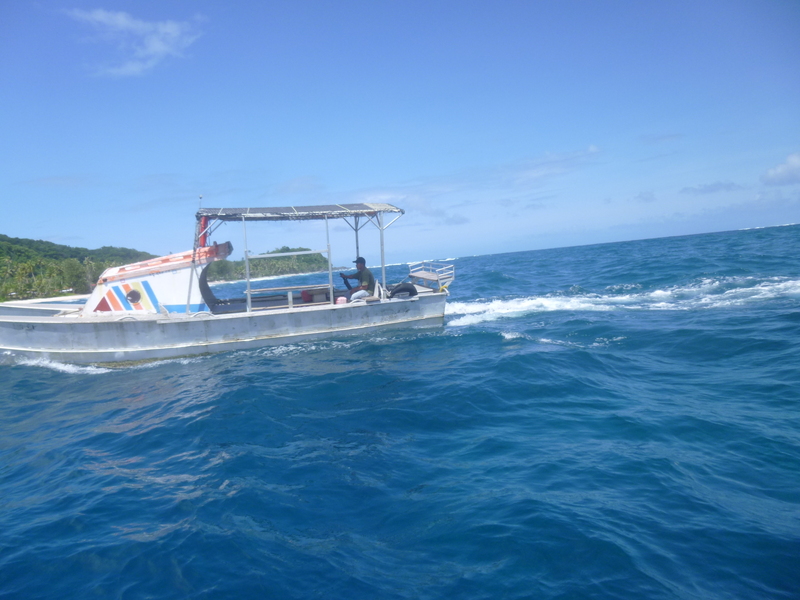 In the end, the boat seemed well suited for its job, despite its size. It rode the waves well and was a pleasant 15-20 minute ride. The fare used to be $1, but it just recently went up to $2. 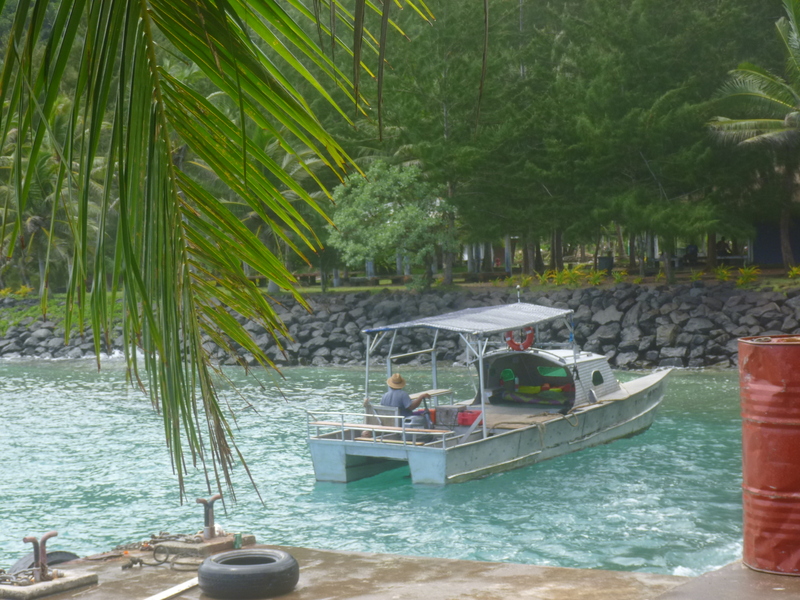 The other family had done a bit of shopping, and the boat is the only way for them to transport everything. When we got off on Aunu’u Island, the first thing I noticed was a church. Then there were a couple clusters of small houses, and just a few vehicles. I’m not sure how the vehicles get over there! 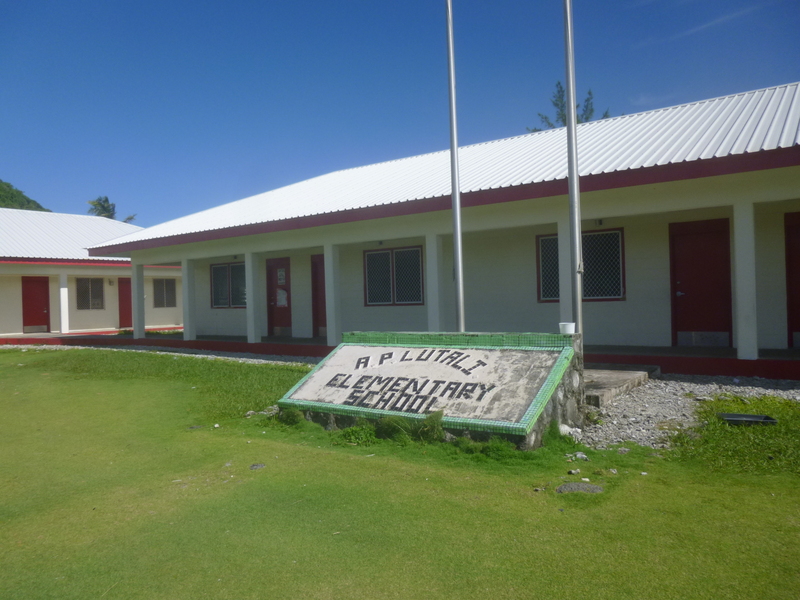 I headed off along a path on one side of the island, and I eventually came to the elementary school. It was bigger than I would have thought, considering the size of the island. 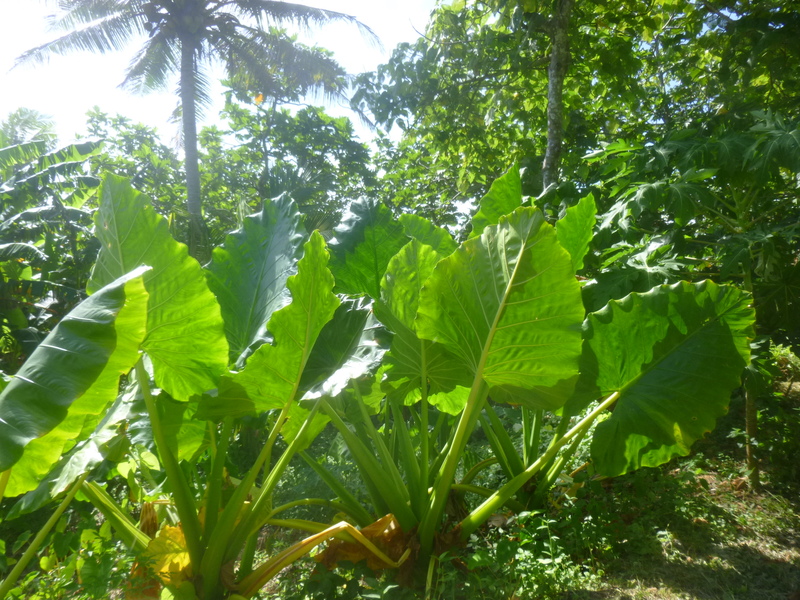 There was a wide, well-trimmed path up the side of the mountain, past a couple banana and coconut plantations. I got to the top, and then the path down the other side wasn’t as well marked, and heeding some warnings about previous careless tourists, I went back down the safe way I went up! I walked past the school again and spoke briefly to one of the teachers. She said the kids go to elementary school on the island, but have to go over the big island for high school. 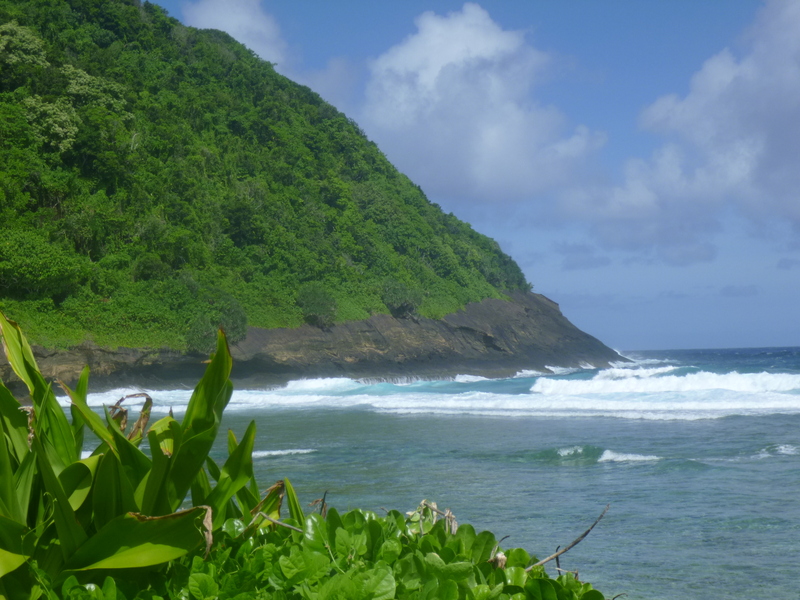 And speaking of education, American Samoa has a community college, and there is an education program, and I believe graduates can teach on the island after completing their associate’s degree. I had taken a little longer than I thought in walking about, and then had to wait quite a while for the next boat to come, and then was a little concerned about time, since buses stop running back to town around 5. A couple kids came up to talk while I was waiting for the boat, and the 8 yr old girl seemed quite concerned that I was traveling by myself, without a husband and all my kids along! It was quite sweet! She also went into bloody detail about the accident on the rocks that “the other white people” had – I had even heard somewhere else that one of them may have fallen to his death – alcohol was involved. 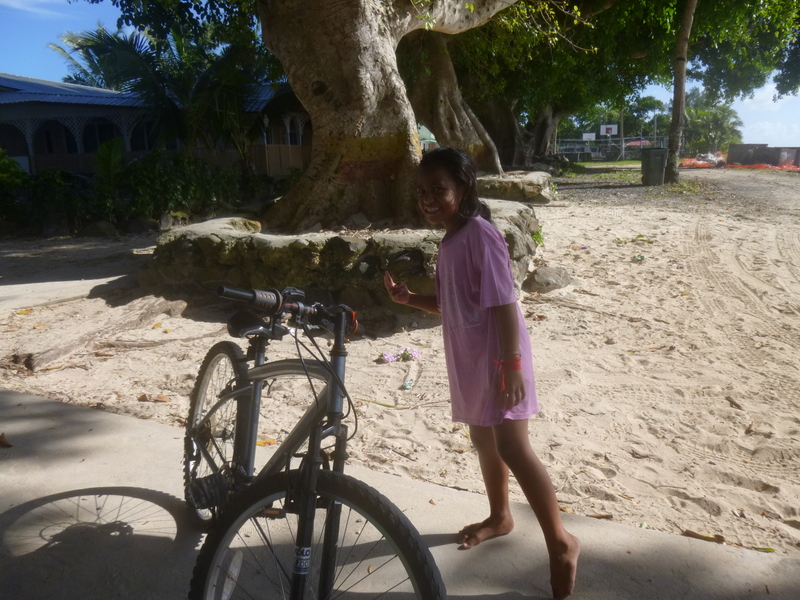 This 8 yr old girl has never once been off her little island – and it didnt seem to bother her in the least! Anyway, the boat finally came back and I was the only passenger. It was fun talking to the driver – his name sounded like Ellic. 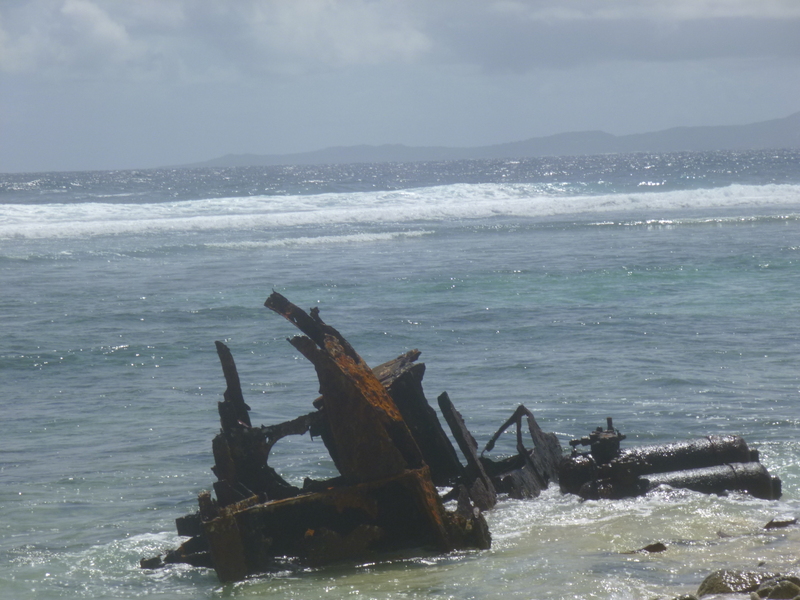 He wondered what I was doing in Samoa, and we talked about his boat and how high the seas get before the boats stop running – 6 foot waves seem to be the limit for those boats. He makes many trips back and forth a day. Even though there was a bus stop by the boat harbor, it was nearly 5:00 once I got back on the big island, so instead of waiting, I figured I better start walking. One lady thought the last bus had gone by, but other people were quite certain there would be one more. I walked 2-3 miles and still no bus. It was still light out and a pretty evening so I didn’t really mind, although it was still quite warm. 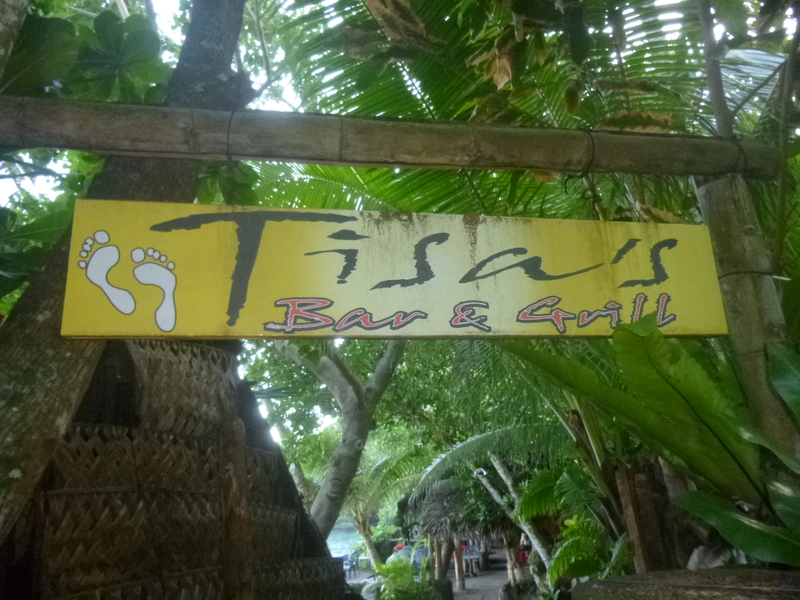 I walked a little more, and figured I was going to miss my nice dinner at Tisa’s. I was already later than I had expected to be. I walked a little more, and then a black SUV pulled up and a very kind-looking lady asked if I needed a ride. Her college age niece was with her and they were so concerned about my walking, and possibly missing the last bus, that I had no qualms about getting in the car with them. And it was so much fun talking with them that I wished the ride could have been longer. She wondered how long I was on the island for, and would have like me to visit them and see their plantation – I would have liked that too! But time runs out. They dropped me at Tisa’s and even waited to make sure I could still get dinner. So thank you, thank you kind people – your names are in my phone, which I no longer have (that story will come later). 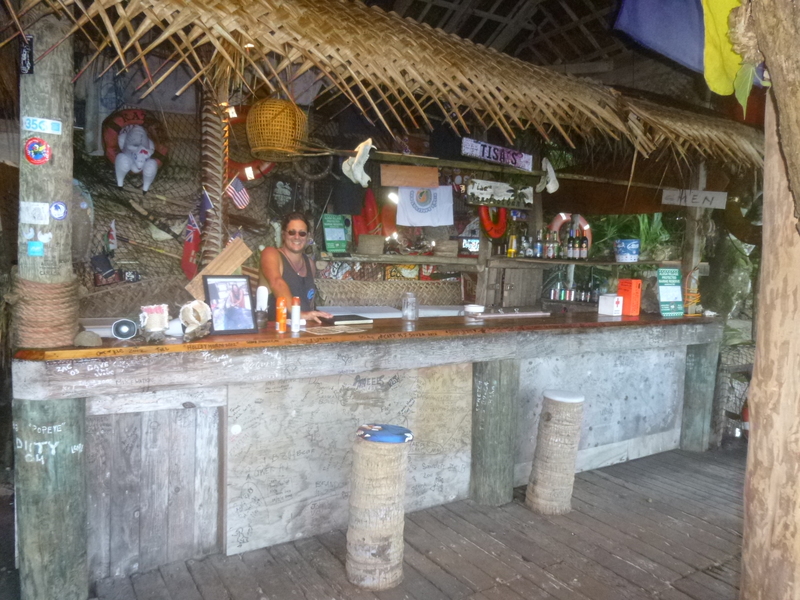 I’m not sure I would have noticed the place on my own – there was just a little wooden sign by the road, and I walked through a little path, and down some steps, then this wonderful open-air wooden bar appeared, along with deck space over the water with room for about 4-6 tables. 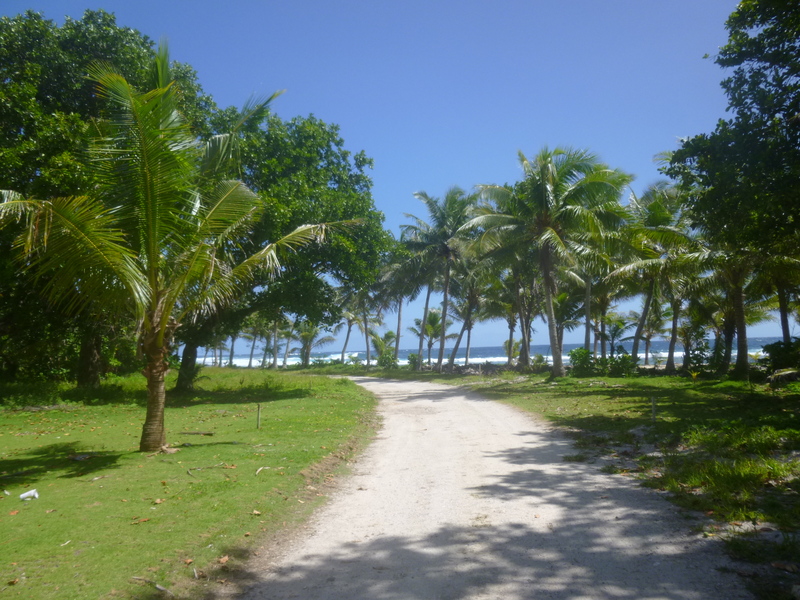 It looked like it belonged in a tropical paradise picture book! 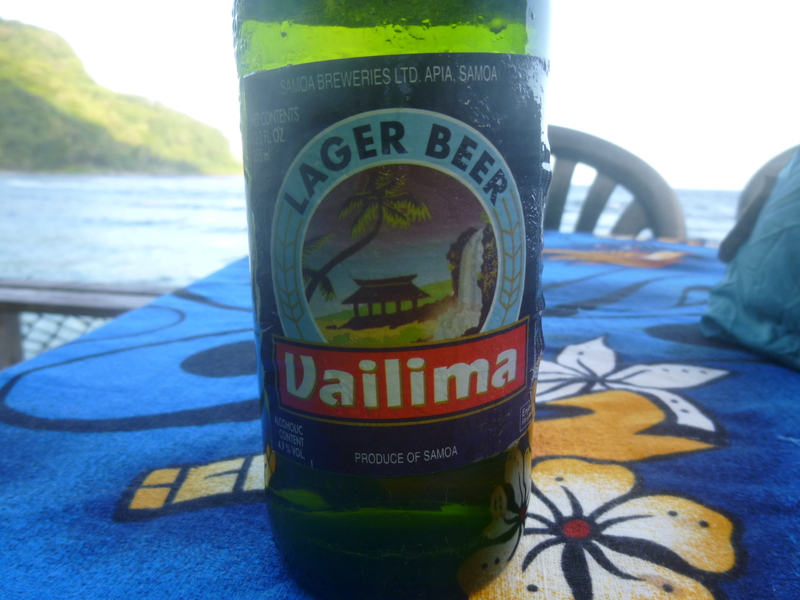 Despite my being later than I thought, I was still the first person there, and they brought me an icy cold local Samoan beer – it hit the spot! The bar/restaurant has been there for 24 years, and has been through 2 hurricanes. The design improves after each hurricane. They brought me their guest book, and it was signed by people from literally all over the world, and by people who were doing solo flights around the world, dropping down here and there to re-fuel, and groups like Greenpeace – it was really interesting. Tisa brought my dinner out – she didn’t want me waiting any longer for the others – it’s a very casual place. 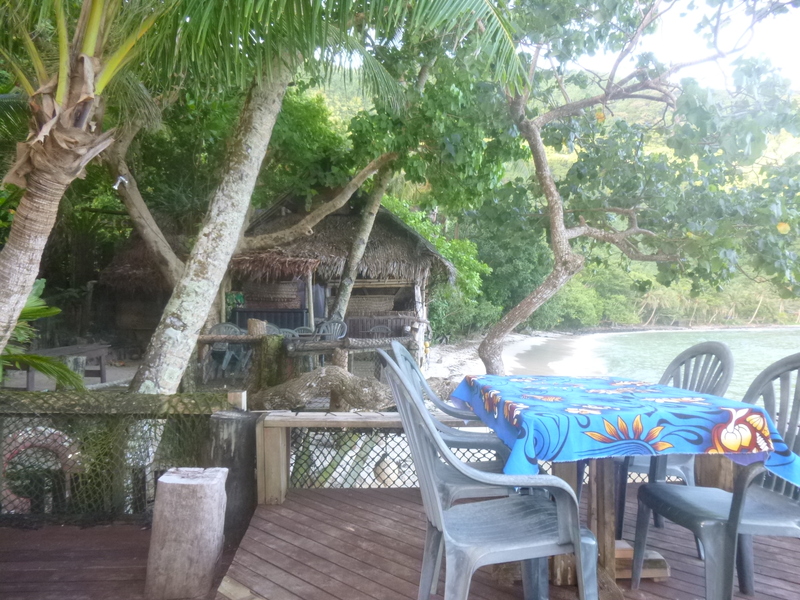 The dinner was all local food straight from the earth and sea – there is no menu; she serves whatever is in season. Tonight’s treat was swordfish that someone had caught and given them, marinated overnight and BBQ’d – delicious! It came with the Samoan version of sweet potatoes – not orange like ours, but thick slices of big whitish potatoes with a yummy coconut cream sauce. The vegetable was kind of a Samoan version of cabbage, and it looked sort of like spinach, but didn’t have a bitter aftertaste. I can’t remember what it was called. There was a little carrot and something else in their too, and another little dollop of the coconut cream sauce. Then there was a big piece of the best papaya I’ve had, already diced in its skin for easy eating. 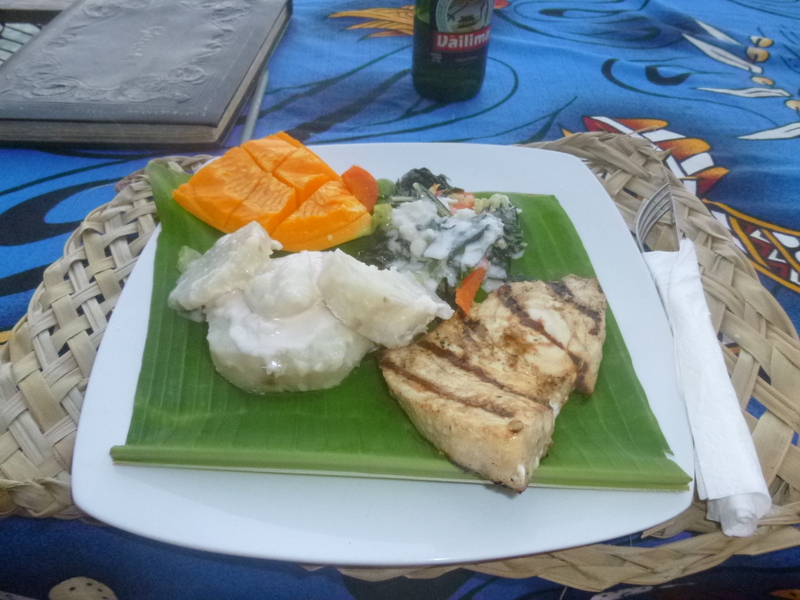 It was all served on a big green leaf (banana leaf i think), which made it very colorful. The fish had just been caught the day before, the potatoes and veggies came from their garden, and the papaya came from their plantation across the street – absolutely delicious. A couple other people arrived just as I got my meal, and a couple more after that. It was a good thing I got my dinner first, because even with time for a drink before their dinner, I still finished at the same time as everyone else. Yes, I’m a slow eater! 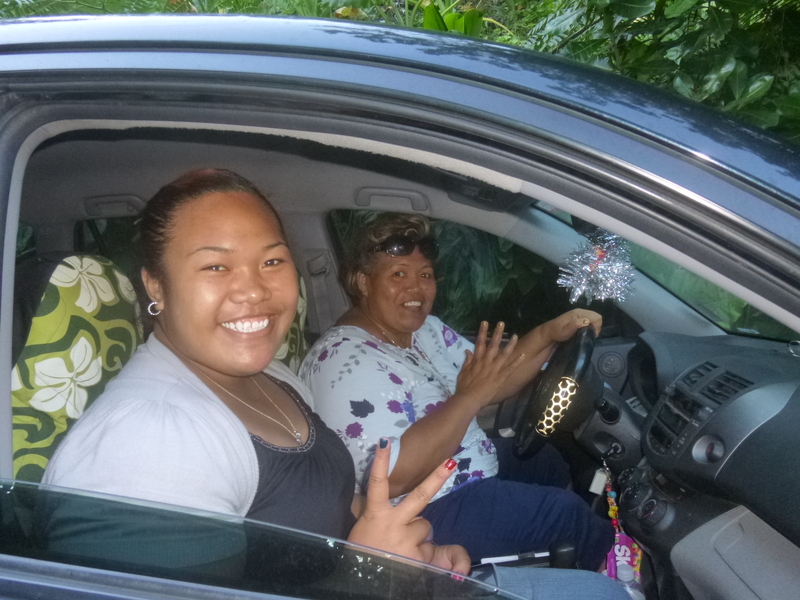 When we were all done visiting, a couple of the people were driving all the way back to the west side of the island, and they dropped me off on the way. Tisa had told me earlier that taxi service was available from her place for those of us without a car, but I was lucky to get (another) free ride back! A wonderful way to end my last full day on Samoa.